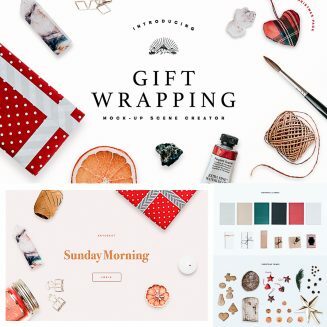 Amazing photo-realistic Mock-Up with various items used in gift wrapping and holiday decoration. We also included Christmas items in it. It’s packed with more than 100+ isolated items – from stationery to natural elements – plus 3 pre-made scenes and 3 backgrounds. File format: .psd, .jpg for Photoshop or other software. Tags: background, candle, christmas gift, creator scene, festive, gift, header, header images, holiday, mockup scene, stationery, toy, wrapping paper, Xmas.